Perfect condo for my husband and me. On Oahu for medical procedure. We chose this condo for location and firework views :) Great layout for us. Fantastic view over harbor and lagoon. Friday night fireworks were great!Comfortable and Clean. Great price! If you want sleek and sophisticated - choose something else. Tons of generic sterile hotels in Waikiki. Felt like we were staying at my Aunties house. That's what we like about staying in privately owned condos, homes and houseboats. Hope to be back for fun next time. This is our 6th year in a row at the Illkai Marina, second time in apt 1190, clearly we like it! It is light and bright and we really appreciated both the king bed and all the counter space in the bathroom. For the price, space and the amazing view of marina, we can't imagine a better value accommodation option. Sure, like all the apartments in the building it is dated, but it was clean and had everything we needed for a lovely 10 days in Waikiki. It was handy being walking distance to Ala Moana as were there for Black Friday and took advantage of the sales. I would also recommend the Harbour Pub downstairs. Comfortable, adequate condo in a great location. Tiny lanai though hard to sit outside and enjoy the beautiful views. Clean. This condo is well set up with all the things you need. The decor is dated and could definitely use an update and some TLC. The website does show the decor but not the peeling paint etc. on cabinets. However it was clean and served our needs. The two things that I did not realize from the website was how small the balcony was (stunning view) and that there is no pool in this building although it does look like they have plans for one on the roof. The location is good, an easy walk to the beach in front of the Hilton Hawaiian Village. The last thing is the price breakdown is a bit off as the reservation fee quoted and the service fee were much higher. The VRBO website should reflect the actual costs. The view over the harbor was enjoyable even though the balcony was so tiny. We enjoyed the view of the Friday night fireworks. The kitchen was well equipped, but the stove needs to be leveled since it is wobbly and the stove top needs a good cleaning. The bathroom needs remodeling since the shower has mold, and entering the bathtub with no safety bars and the sliding shower doors makes it unsafe. The bathroom sink has an open drain making it possible to lose a ring into the drain. The condo is in great need of painting the walls, ceiling, and woodwork. We found the air conditioning hard to control with a blower coming on even when it is turned off. The girls who cleaned the condo were very pleasant and did a great job. The patio door and the mirrors were always spotless. Thank you for your review and comments about the unit 1190 at the Ilikai Marina. The view is amazing and certainly can be enjoyed from the main living area and from the lanai. The size of the lanai of course cannot be changed and is the design of the building but pictures are very clear on the website for all areas of this condo including the lanai. Safety bars in the tub area are not the standard and will only be assured of them if you book a handicapped equipped unit. If the stove was wobbly, we wish you would have let us know so we could have sent someone over to help. I am sure it would just take the adjustment of the feet. I have already now assigned someone to look into that. The owner is in the process of painting but has not been able to get it completely finished because of the high demand and future bookings. However as soon as possible it will be continued. The air conditioners in these units were replaced with brand new units just a couple of years ago. They work well and the controls are a bit different . Perhaps you did not have the settings correct but if you had mentioned it, we could have sent someone to come by and help with it. Thank you for mentioning the cleanliness of the slider doors and mirrors. It is a great challange with the ocean so near and the salt in the air keeping those cleaned. We were very disappointed with this accomodation. Within the advertising documentation there is no mention that this is a very old, tired and grimy dwelling. Had to get the rep in to show him the state of the draw runners which were caked in old food droppings and had never ever been cleaned. The unit itself requires a thorough deep clean as in its current state it's not fit for normal clean living. There were also really odd numbers of glasses available, in some instances only one or two of each type. Whilst the view from the balcony is just fantastic it does not deter from the cleanliness of the property. It was not clean when we entered it and I will be extremely unhappy if I have been charged to have it "cleaned" on our leaving it. If this condo were refurbished and modernized it would definitely be worth the money, if not more. We read your review about your disappointment. Our advertising on our websites gives multiple pictures that one can review and see exactly what the condo looks like. You can see the finishes and the style and can decide for yourself if the condo is something that would meet your needs. Your review does mention the cleanliness of the unit but you have not given us any details in regards to that so that we could remedy the possible issues except for the crumbs in the drawer rollers. The on island contact did look at the rollers when you called him over and he said, there were a few crumbs in the roller of the drawer in which he apologized for. The condo having a collection of different glass we do not believe is an issue as long as there are enough glasses to accommodate, they do not all have to match. Thank you for your suggestions about updating the condo. These condos are individually owned and it is up to each owner on what upgrades they feel they would like to do or if they are happy with the finishes they currently have. Most of these owners do spend time in their units. Updating units can be very expensive and most likely would drive the nightly rate of a unit up which there are guests that do appreciate the lower rates and that option. 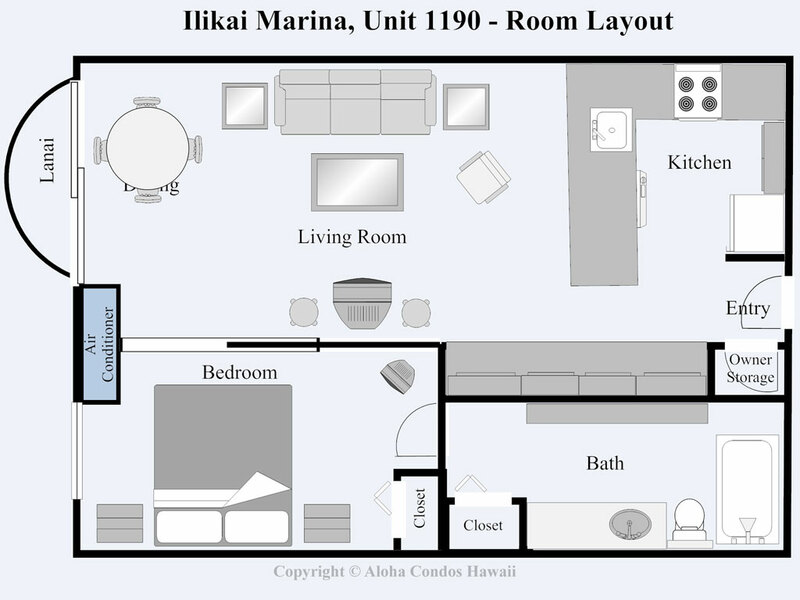 We received your review for the unit 1190 at the Ilikai Marina. We were very suprised at the issues you have mentioned and why you had not contacted us about them before this. You did call our on island contact who came over to help you with the TV and WiFi which you needed help with. He was glad to be able to help and you did mention the batteries for the remote while he was there. However the remotes that did not have batteries were old remotes that were no longer in use. The current TV remotes did have batteries. If you had mentioned these other things to him at that time, he could have helped you with them. The lights in the kitchen and the entry are all working but you must have been using the wrong switches. We can maybe put a note on the switches to help. The light fixture did not fall out of the ceiling in the bathroom but it was the cover grid and when we looked later it was in place. The owner is looking at doing some upgrades on the unit but the reasonable pricing is very helpful for some guests that are on a buget. If you did have an issue with any cleaning, it would have been addressed right away if you had mentioned it to us or our contact while he was there. The condo does not have a baday so we are confused as to why you mentioned this in your review. The public parking is a private company that is out of our control. However if you told him the lenght of your stay in the beginning, I believe they would have charged you per day and not per exit. The choice each guest decides for parking is not our responsibility. There are many options. The bed sheets are the correct size for the bed and I double checked with the cleaning crew. In order to serve our guests, we do hope they will contact us if there is a problem and we are happy to resolve them. Perfect condo for my husband and me. On Oahu for medical procedure. We chose this condo for location and firework views :)Great layout for us. Fantastic view over harbor and lagoon. Friday night fireworks were great!Comfortable and Clean. Great price! If you want sleek and sophisticated - choose something else. Tons of generic sterile hotels in Waikiki.Felt like we were staying at my Aunties house. That's what we like about staying in privately owned condos, homes and houseboats.Hope to be back for fun next time. To avoid repeating all the good things already stated by previous reviewers, I will just say that I agree with the other positive reviews of this Condo. I would add that the parking structure is surprisingly good: it's part of the same structure as the condos, easy ingress/egress, plenty of parking spots, and the spots are large so you don't have to worry about vehicle dings and other damage. I'll definitely stay at Condo 1190 again! This was my 4th stay at the Ilikai Marina, first time in this condo and I would stay there again. I love the location for the view it provides, easy access in and out of the area, parking onsite, etc. This condo was very comfortable to be in (chairs, kitchen, bed - didn't pull out the sofa bed). Things like soft sheets, good water pressure in the shower, comfy sofa can make or break a stay and this condo had all of the above. I had no issues, no complaints and all in all had a great stay. I would recommend this condo to my friends and family when staying in Honolulu. We wanted to let you know how much we enjoyed our 12 days vacation in unit 1190 at the Ilikai Marina Condos this past March, 2018. This was our first time visiting Oahu and were unsure what to expect. Unit 1190 was more than we could have hoped for - it was extremely comfortable and roomy. The sunsets from the lanai were amazing! The beach is a short 4 minute walk, there are many restaurants nearby, and even an ABC mini-mart within a block. I worked with Christine at Aloha Condos and she was extremely polite and helpful. I appreciated the communication from their office regarding reservations, payment dates and check-in information. Very helpful. Mahalo for the wonderful memories!! Thank you for taking the time to post a review for the unit 1190 at the Ilikai Marina. We are glad to hear you enjoyed your stay. We will let the owners know your comments but often it is more a matter of taste and what one likes. The pictures on the website do depict the unit docor and features so one can choose when booking. Would have given this a 5* as it is comfortable! great location and has everything you will need, but overall accommodation is dated and shower needs some work. Condo is clean and within walking distance of a foodland grocery store and then many restaurants. We have stayed in this building before and love its location to the beach and anything else you might need. We were lucky to see the Friday fireworks from our lanai and then filming of Hawaii 5-0 one night. Some of the other units we have stayed in have been totally renovated, which is why we rated this unit a 4. In our opinion the beach near the Royal Hawaiian hotel (right next to this location) is WAY quieter and far less people. It also still has beautiful sand to sit on. Waikiki beach itself is almost all washed into the ocean and a nice close walk if you really want to be there. Illikai Marina is a wonderful central spot to stay and the owner has this unit rented at a fare price nightly. We would recommend to anyone looking for something other than a standard hotel room. Thank you so much for the great review for the unit 1190 at the Ilikai Marina. Thank you for you comments about the room being clean and having everything you needed. It is a perfect location as you noted and close to everything. There are some coffee shops at the Hilton Hawaiian Village one to include Starbucks and a couple others all which are not to far away. We were here from 10-23 to 11-01-2017 and had great time everything was very good except one thing!!! !Some of the area was very dirty especially around the bed and couches. Very nice. New tiled floors, so bring your house slippers to ensure that your feet are comfortable. I didn't read the description well enough...no pool in this condo...but it was ok since there was no time for us to enjoy a pool during this stay. Beds where comfortable! The tv in the bedroom is old and the sound is muffled...so if you are like me and enjoy having the tv put you to sleep...choose to sleep in the living area on the pullout. Thank you for the 5 star rating! We are happy you found the condo to be very nice. There is no pool in this complex but the ocean is a short walk right across the Marina parking lot. Also the Lagoon is a nice replacement for a pool with calm waters. We will have someone look into the TV issue as we had not had that complaint. Thank you again for your feedback. 5th year in a row at the Illikai Marina! This is our 5th year in a row at the Illkai Marina (in three different apartments), we are a big fan of the location. It was our first time in apt 1190, and it is our favourite apartment out of the three we have stayed in. It is light and bright and we really appreciated both the king bed and all the counter space in the bathroom. For the price, space and the amazing view of marina, we can't imagine a better accommodation option (I feel sorry for people who pay twice the price to stay in a hotel room with no view!). Sure, like all the apartments in the building it is slightly dated, but it is well maintained, clean and had plenty of towels, beach towels and everything we needed for our lovely week in Waikiki. It was handy having a laundry in the building, being walking distance to both Ala Moana and the centre of Waikiki, and having the Harbour Pub downstairs. We will definitely be back and continue to recommended it to our friends and family. The views from this condo over the marina can't be beat and the apartment itself is very comfortable. We thoroughly enjoyed staying there. It is fully equipped for self- catering and within walking distance of many restaurants, shopping and beaches. Parking was easy and directly connected to the building. Aloha Condos provided excellent support pre- visit and everything was as- advertised. We had a completely positive experience. It is an excellent choice for two people visiting Oahu. We so appreciate your review and taking the time to post. We are glad you found the unit well equipped and comfortable. It is a great location and the views are exceptional. Please come again soon! Great Location and great view! Bathroom needs some updating and a fresh coat of paint. Add a new mattress and this would be a perfect 5! The condo was very clean and uncluttered, which helped us relax as soon as we arrived. Much of the furniture is obviously new, and the bed was comfortable. The view over the Marina is beautiful, particularly at sunset. There are many restaurants in this building and in the surrounding area, and a convenience store just across the street which we found very helpful. We will rent this unit again. The unit offers good value for the price. Easy to relax in this area within 15 minute walk of the hustle and bustle. Thanks for sending in your review of unit 1190 at the Ilikai Marina. This unit does have a very reasonable rate while at the same time offering a great location with close proximity to everything! The beaches, restaurants, shopping and activities are all about. Thank you again for your review. Found our ideal place to stay! This condo unit is by far the best one in Ilikai Marina.Parking is reasonable and always enough available.Elevators are fast and efficient.Kitchen is well stocked with every item you can think of.Bathroom vanity is long enough to place all your items.And the toilet!My favorite!Just like in asian countries with the heated seat and water bidet.This item alone will keep me coming back!The king size bed was very comfortable.In addition,the roll out sofa/bed in the living room could easily fit two adults or kids.Thank you for making this unit feel like a home away from home. Beautiful ocean views, spacious condo compared to a hotel room, kitchen well stocked even though we didn't cook. My son is ready to book it again for our next Hawaii trip. Mahalo! nice as always - fair in quality and price! It was nice once again to stay at the Ilikai Marina for 10 days this time (from July 15 to 25, 2016). The service - booking and arrangement are professional, with special Mahalo to Monica - local manager of the condo suite. With respect to the condo 1190 itself, perhaps a new flooring - floating wood and a layer of painting to refresh the suite would be appropriate. Perhaps also acquiring a new bedding sheets, always on sale at Macy's (Ala Moana Shopping Centre) - under $100 - king/queen size. Other than these, the rental of the suite is fair in terms of quality and price. Thank you for posting a review for unit 1190 at the Ilikai Marina. We always appreciate feedback so we can make sure the guests are happy with the units. Thank you for mentioning the management team as we do try to make your reservtaions flow smoothly and are there to answer any questions that might come up. These units are owned by private owners and with that come different tastes. We can mention your suggestions to the owner. The housekeeping staff does assess the linens and acquires new bedding and towels as necessary. It is a really reasonable price and such a good location and accommodating unit. Every year I take vacation to Hawaii but it was my first time stayung at condo.Ilikai Marina 1190 was more than I expected. Great view, Great location. The condo has everything that I needed for my vacation in Hawaii. I difinitely want to come back again. Thank you. We thoroughly enjoyed our stay chez 1190. The Condo was super comfortable and it was very well equiped with everything we needed and beyond. The view is amazing and super comfy King Size bed to boot. Yes, it's old school, but that didn't worry us at all. It's not right in the guts of Waikiki but for those who want to escape the main drag, this little oasis by the Marina is for you. Walk across the road to ABC Superette, 5 mins from the beach, 10 mins walk to Ala Moana, 2 mins to buses that will take you everywhere. Enough said and Aloha! Thank you for the posting of your review. We are always happy to hear you enjoyed your stay and the unit had everything you needed. It is a very affordable 1 bedroom unit and the views cannot be beat! It is conveniently located by the beach, the stores, the buses and the restaurants. Thanks again and come again! Really loved the condo. Great view and mirrors made it look even bigger. Bed is nice and soft; we had a great nights sleep. Three items need to be fixed: ice maker in refrigerate is not working, ceiling fan pull cords are not functioning (can't change speeds and can't turn the light off without turning fan off. The a/c thermostat has to be turned down to 64 degs. in order for the rooms to cool down to a comfortable 74 degs. I thinks this is because the thermostat is located in the wrong place. It's directly under the supply duct, so it senses the cold air coming out and not the actual room temperature. If possible, the thermostat should be moved further into the living room near the kitchen in order to sense the actual room temperature. The thermostat itself is too complicated for a rental unit. I'm not interested in setting temperatures for each day of the week and different hours of the day. I suggest getting a simple thermostat which sets three things: heat/cold, fan on/auto, and temperature up/down. Having said all this, we would still enjoy and want to stay there again. Thanks for your time in posting the review. We are always happy to hear you loved the condo and would stay again! The air conditioning system is brand new and installed by the complex and is the same thoughout the whole building. We are placing instructions for the settings so that our guest can operate it with more ease. As far as the other items you mentioned, we will have those looked at for proper function. Thank you again for letting know so that we can tend to these things. central location, great view and good room set up. Mahalo for your review! this unit does have an incredible view and the location could not be better, convenient to everything! Please come again! Brilliant location. Well equipped condo. Everything you could possibly need. Will definitely stay here again on our next visit. Thank you for your review. The location is right where you want to be and close to everything. It is an accommodating unit and we are so glad to hear you will be back. Thank you for your business. Condo very nice, beautiful view, and great location. Was clean and nicely equipped. Had coffee maker but no coffee; not even at least enough for one morning. Biggest drawback was there was no pool. This condo seemed bigger because of the mirrors on the main wall and in the kitchen. We cooked all our meals so we appreciated the dishes, pans, cutlery more than met our needs. We found out that you can take the elevator to the second floor, and follow the walkway through another hotel pool and the Ilikai garden, down the ramp and over to the Hilton Lagoon. It was a great find!!! The Ilikai Marina view of sunsets is amazing. It was a perfect week for us. We came to Hawaii on a cruise ship and had suitcases to deal with until 3:00 PM. We found out from Security that we could store them over at the Ilikai Bell Hop desk for 1$ a bag and probably a tip. Well worth it! Lovely stay. The cleaning staff was cooperative and allowed us to move directly to a second condo in the building due to our change of plans. We loved our stay in 1190! The condo was completely furnished with everything we could possibly need during our stay. The bed was comfortable, air conditioning was a perfect temperature. We didn't cook, as we enjoyed many meals at Cinnamons nearby. The ONLY thing that could have been better were the comfort of the chair and sofa in the livingroom. Another suggestion would be to have a snorkel set there on hand. Everything else out-weighed to my rating this place with a B+. Thank you to the owners for allowing us spend a few days in their home! Instant response and friendly service from the moment I inquired about this unit. Reservation and payment were seamless. Parking instructions and entrance to the condo very easy to follow. Everything you need is in the unit; pots, pans, hair dryer, beach towels, beach chairs, wine glasses, some canned goods, extra bedding, plenty towels, blow up mattress, anything and everything you need. View was fabulous! Unit is a little dated and shower drain a little slow, just an observation and really was the last thing on my mind. You're in Hawaii so hopefully you're making memories outside in the surf and sand. Everything including the bed was comfortable. I've already told my family and friends about this and the other units available with alohacondos.com . Thank you for letting me enjoy your condo. We had the most amazing stay. The veiw was breath taking. The apartment was spacious and lovely we felt very at home. A great place to sit back, relax and indulge on some wine whilst watching the beautiful sunset and sorroundings. It was hard to pack our bags and leave. The hotel security guards were so helpful with all information. Our stay in this condo was great. The views are amazing and the location perfect. Everything was provided to make our one week stay very comfortable. The kitchen is fully equipped and functional. The A/C had a tough time keeping up with the afternoon sun but not a major issue. The unit does show signs of frequent use but was clean and comfortable. Would not hesitate to recommend this unit to any couple desiring a great value and convenient location. Clean and attractive updated condo overlooking the small boat marina and ocean. Located at the quieter top of Waikiki near Ala Moana Beach Park and Hilton Hawaiian Village. Easy walking, plus convenient garage below for your car in and out. Pay ahead for length of your stay on first garage exit for best rate. Condo is kid-friendly with board games and dvds, beach towels and some beach gear. Full kitchen with plenty of cookware and dinnerware. Pay laundry on 8th floor for guests. Pool privileges at adjacent hotel grounds across 2nd floor pedestrian bridge. As condos have a limit of 4 guests, we rented 2 condos thru this agency-- on the same 11th floor, #1190 and #1182-- so our extended family could be together. Having two living spaces and two bathrooms was ideal. The view was wonderful. We could see the sunset from the livingroom and bed room. Many birds perched on the wondows. The location is also nice. Especially the survices were excellent. The stuff came to the room about 15 minutes when we asked how to reset the internet modem. Owing to 1190 we could enjoy our vacation very much. Thank you! Convenient location and GREAT view. We have stayed at the Ilikai and Ilikai Marina on several occasions and we like the location. Easy access to Waikiki beach, shopping, dining and bus. Our favorite thing is the view. We always choose condos overlooking the Marina and get wonderful sunsets included. A couple things to be aware of... there is no pool at the Ilikai Marina. This is not an issue for us as we have a pool at home and when in Hawaii, we prefer the ocean. The lanais (balconies) are very small. This condo (1190) has a nicely updated kitchen and a large bathroom with plenty of counter space in both. Aloha Condos is great to work with, from the website to personal contact. We had one problem while we were there and they took care of it immediately. They provide starter supplies of TP, soap, etc. and as with most condo rentals, if you require more you buy it yourself. They are working with the owner on further updates to this condo so I guessing the sofa and bed will be replaced soon as those were worn and saggy and are really the only downsides. They have installed a combo lock so there is no need for a key. I really like that. The free wi-fi worked well with my netbook. This was the first time that I rented a car for a couple days and used the garage. It was convenient and only $20/day, which in Waikiki is not that bad. Overall I have added this unit to my list of favorites in the area. Thank you so much for your review as we so do appreciate them and refer to them as needed. We are glad that you have found the unit to be a place you would enjoy coming back to. It is a great location and the views are pretty special. We are available for questions during the stay and do try to respond as soon as we can. We look forward to accommodating you in your next stay. Mahalo for your business. The room was very nice. It was perfect for three people as there was a king bed and a sofa (however the fold out sofa was very old and uncomfortable, my mom just folded it in and slept on the "couch" portion). The kitchen and stove worked well, as did the dishwasher, fridge, and oven. Bathrooms were clean with extra towels provided. WIFI was fast enough. This place is perfect if you know you're going to be out and about most of the day and will just be using the place to eat, sleep, and relax. The balcony and dinner table are perfect places to relax as the view is amazing. The place is a little small but you don't even notice because the right wall is completely covered in wall mirrors that reflect the ocean view making the place look and feel quite open. Really enjoyed our stay at this apartment. Kitchen well equipped and we appreciated the extras such as spices, cling-wrap etc which were a bonus. View from the balcony was stunning and apartment was in close proximity to ala Moana centre, restaurants, beach etc. We stayed 8 days and enjoyed our stay. Between ala Moana and Waikiki, everything in walking distance and not noisy.I go along with previous reviews concerning location, facilities, ..., kitchen well stocked, it is clean but some old spots on towels and blanket, should be replaced.The overall rating (average) is because of the necessity of updating here and there (mattress, towel rack, blinds, sofa) but I recommend it. Mahalo for your stay and for your review. This property is now under new management. We began by having the carpets professionally cleaned, the pillows and towels replaced and the blinds repaired. We are working with the homeowners on updates throughout the condo in the coming months. We hope you will return to enjoy this property again. Great view but could be much better!! Yes the view is great and the kitchen is well stocked and it is very clean. The owners need to spend some money updating. The vertical blinds are old and do not shut properly therefore hopeless at keeping out the sun in the afternoon. If you happen to want to watch the TV it is so old and not a flat screen so you cannot even see it in the afternoon glare, not good. Hey you can by a medium size decent LCD or plasma for $400 bucks or so.!! The so called towel rails are a joke they keep falling down, but we made do, just hung our towels wherever we could. The bed was extremely uncomfortable on one side (the side near the bathroom door) needs replacing.. If you had four people staying you would have to take turns to sit out on the tiny lanai!! The owners should spend some money and then it would be a four star maybe!! Thank you for your comments and we are happy you found the condo clean and well stocked and that you enjoyed the view. We have just taken over management of this condo and have set out to make several improvements, so your list is very helpful. The blinds and towel rods have already been repaired, the carpets professionally steam cleaned and pillows & towels replaced. We will continue to make improvements in the future. Fantastic location and view. Good value for this prime spot. We were delighted with the condo. Everything was as expected. Well managed and no false advertising. We did not need to contact anybody about anything because everything worked and condo was well stocked. The reason I am rating the comfort as only average is that the hide-a-bed mattress was very saggy. Our roommate got a backache sleeping on it. Also the dishes were not great in the microwave and did not fit in the dishwasher properly. Everything else was excellent. Fantastic - best condo in Ilikai Marina!!! We vacation in Hawaii about twice a year to visit family. We love the Ilikai Marina, due to the location & floor plan. We have stayed at numerous condos in the Ilikai Marina, but this condo has been the best!!! It is beautifully decorated, completely stocked, super clean, and has everything you could possibly need. It is located on a higher floor, so has a terrific view of the ocean. We loved this condo, and will definitely stay at this one again! Aloha Condos was easy to book with, and we even received friendly emails from the owners. The location is at the beginning, and therefore more quiet end of Waikiki. It is within walking distance of ala Moana shopping center, and next door to the Ilikai and Hilton Hawaiian Village. A very enjoyable stay of thirteen nights. Comfortable with ample space for two people. The mirrored wall really does give an expanded view (partially in reverse) with constantly changing water activity. Grandstand view of fireworks on Tuesday and Friday evenings. Kitchen is well equipped and convenient. Bathroom spacious with good shower and bidet seat. Bed very comfortable. Had no street noise problems during stay. Check in was simple - met alice who cares for condo - lovely person. Bus stops both east and west very handy.Beaches and supply stores easy walk.Only minor inconvenience was falling bathroom towel rails. It was a completely comfortable condominium!The scenery to watch from a porch was very splendid.The access to the beach was fairly convenient, too.A lot of spaces were easy to use the loft for the parking lot.I used the opposite side of the street aBC store several times in the middle of the night.I write it down as follows when I am interested daringly.There is the thing which a nail jumps out of to a seat part of the chair.A sofa bed goes bad a little.The electric bulb of the kitchen was able to cut one.The smell of a considerably strong detergent did not come out of the room for a few days since I entered a room. Mahalo for taking time to submit a review and we’re pleased that you enjoyed our condo. If you choose to stay with us again (and we sincerely hope that you do), please don’t hesitate to phone our island contact during your visit if you would like any assistance whatsoever. We will act promptly to address any problem. The specific items that you mention have been corrected. The condo is perfect and has more than enough room for a couple. It may feel a bit cramped with additional people, though. The views are beautiful, and the kitchen is well equipped (although we didn't do much cooking, it was nice to have the option). The bed is also super soft and comfy, and I loved having the ample counter top space in the bathroom. Two minor drawbacks: the shower isn't the most modern, and the lanai is almost nonexistent. Neither of these issues were that bothersome, however. I would definitely stay in this condo again! Great condo, nice and clean, with an incredible view! I've never had an unobstructed view of the ocean.....I could sit there and stare out the sliding glass door for hours! The condo complex is nice and quiet, we never heard anyone else, and staying at a condo like this is so great because you don't get woken up by the housekeepers vacuuming and making noise. This condo is supplied with lots of things.....hairdryer (yeh! ), vacuum, extra sheets, books on Oahu, a magnified mirror in the bathroom drawer. Tips: You'll need 2 in quarters for each wash and dry. Bring your own detergent for laundry from home in a zip-loc bag....you'll save money and waste by not having to buy some there! A few cons:- The sofa bed is very uncomfortable.....it is impossible to sleep on due to bowing in the middle.....don't count on this as a sleeping option.- The cost of parking at the condo is ridiculous, 17/day. The only other option is parking out near the marina, but it is metered and has time limits. Overall, though, we were very happy with the condo, and would recommend. Wish we could own one just like it there! We had gone online in search of a vacation rental for a week. All of the reviews we had seen were very positive, and our stay only reinforced that. It was a little confusing to find the building, but once there, using the lockbox to get in was extremely simple.The view is incredible, and is definitely one of the selling points. The sunset over the water, combined with a glass of wine on the lanai is pure relaxation. The rest of the apartment is certainly very clean and well furnished, and we cooked several meals in the kitchen without problems.On the second day of our vacation, our car was broken into (with our belonging in the trunk, with nothing visible inside the car) while we were on the beach at the north shore, and we lost our wallets and cell phones. The manager was just incredibly helpful at that stressful time, and even offered to lend us some money in the interim. She was very supportive, and helped in so many ways to get our vacation back on track. That was certainly above and beyond anything we had expected.We will undoubtably stay at the condo the next time we return--the location, the furnishings, the view, and the hospitality are hard to beat. This unit was clean, great location, fabulous view, and well equipped. It was a wonderful place to wake up in, and to come back to at the end of the day. We would hightly recommend it and would definitely come back again. From the very beginning, Chuck was amazing! No detail was left out. Every amenity that could have been thought of, was. No detail was overlooked. We are looking forward to working with Aloha Condos again in the future. The unit was immaculate and the location was perfect, within walking distance to shopping, beaches, resturants. I highly recommend using this property! This was the perfect place for me, as I was visiting our son & daugher-in-law & 6 month old grand daughter who live aboard in a boat in the marina below! Condo was very nice & clean.I was very pleased and hope to stay again. We enjoyed our stay at the Ilikai. The room was just like the pictures. We loved the view, place was clean upon arrival, very nice decor. We would recommend this condo as well as Aloha Condos.com website. The only improvement we would suggest is the hideabed. It's day is done as a bed and as a couch. The whole experience with Aloha condos was positive and the room was great. We really liked the location. I own a timeshare, but decided to rent outside our company. We rented 2 condos. Found this place and line and jumped on the rental quickly. Pricing hotels, this was a much better deal. Being able to have even small meals kept the budget in check. Just the right size for 2, thought I guess some of the rentals do have a sleeper sofa. 2. Laundry. I didn't see the sign for the times on the laundry room and got my loads locked up for the night. We always look for an apartment where we are not subject to Hotel timings & space limitations. We selected on line from quite a few options and were v. pleased with our choice: excellent view, comfortable yet high style design interior. Our sensation that the place might not be as spacious as it appeared on screen was unfounded. Good well managed space layout. Huge, maybe a little too soft, but v comfy bed. Though the bedroom did feel a bit claustrofobic when the sliding door was closed. Any downsides? Yes, maybe - the a/c was not v. efficient and it was a bit un-nerving trying to fathom out how to get into the place when you 1st arrive & the so called security guard was zero help. Think that was the biggest negative - no help on the ground when you get there. And when you rang the number of the person who was meant to BE THERE FOR YOU, if needed, she was at best very distant and you felt you shouldn't have bothered her. Otherwise, really pleased with our choice & the stay. And this was one exceptionally well equipped Condo. Enjoyed it enormously. We spent a lovely ten days at this beautiful condo. It is close to the beach so we could easily carry beach chairs & a cooler(which were provided). The fully equiped kitchen made for some nice evening dinners. Shopping is near by so there is really no need to rent a car. Sitting on the lanai and watching the sunsets were beautiful. I highly recommend this rental condo. It truly was a home away from home. We will be back. Condo was clean,with modern appliances. Very comfortable and a great value. The location is good also.Beautiful views from the lanai.